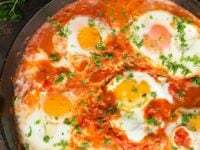 Shakshuka – Recipe and video for delicious Middle Eastern egg dish. Vegetarian, Gluten Free, Healthy, Tasty. 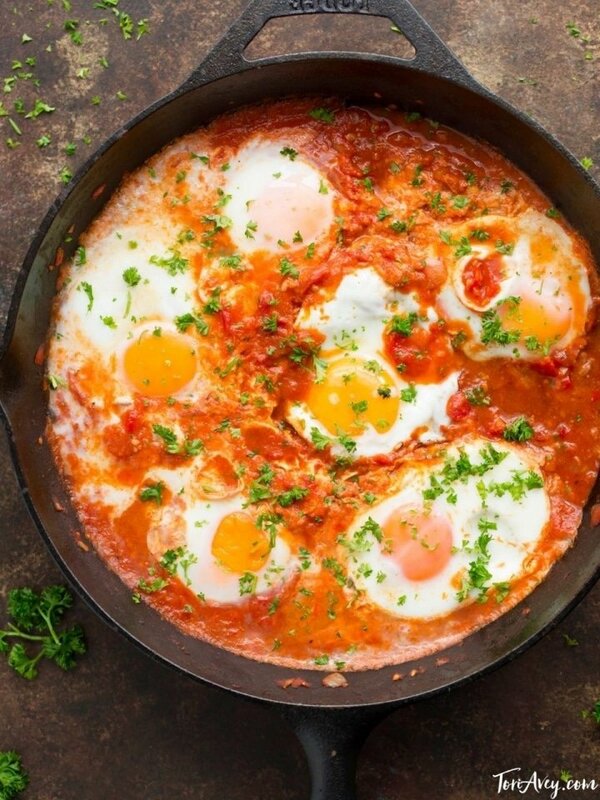 Shakshuka is a North African dish that is now made throughout the Middle East; it is especially popular in Israel, where it is often eaten for breakfast. I usually find myself serving it with a side salad as a light evening meal. It’s super easy and versatile. 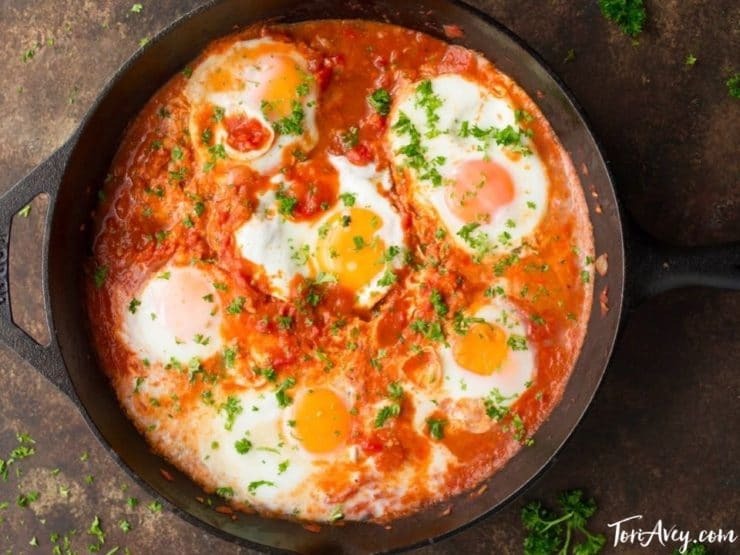 When my hubby was in the Israeli army, he and the other soldiers would sneak into the barracks kitchen late at night and cook shakshuka using whatever they could find in the pantries. It’s a vegetarian one-skillet meal that is easy to make, very healthy, and totally addicting. 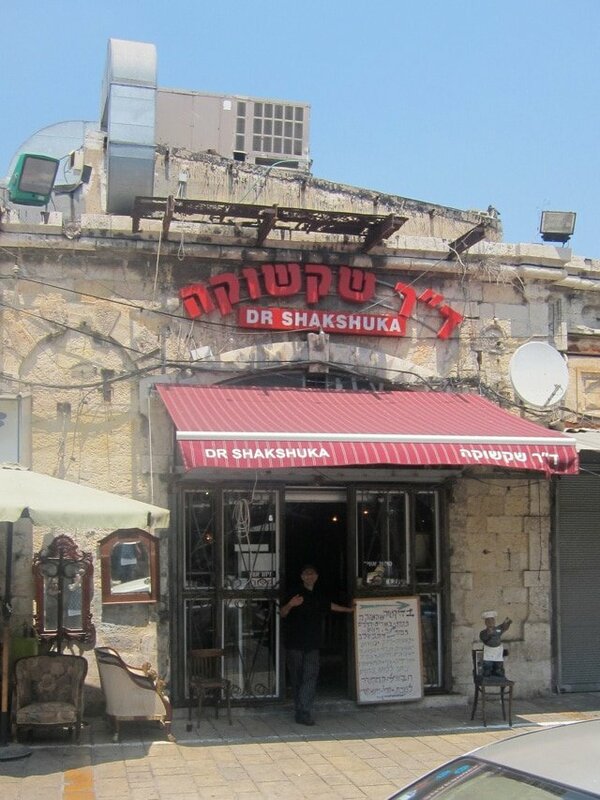 I’ve enjoyed shakshuka several times in Israel, most recently at a famous restaurant called Dr. Shakshuka. The charm of Dr. Shakshuka is evident from the moment you enter. 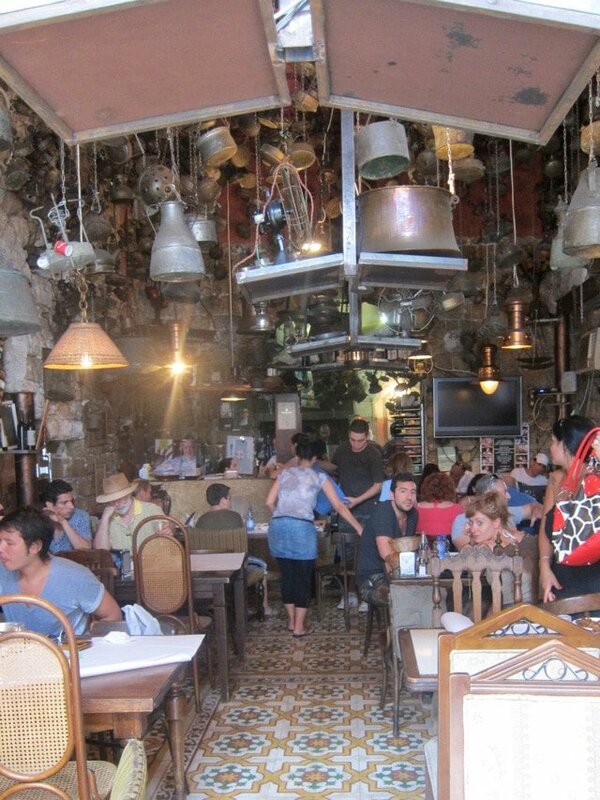 The restaurant is housed in an aging building in the old port city of Jaffa. It’s buzzing all day long with local patrons as well as tourists, everybody eager to taste the “Tripolitanian”-style cooking. The owner Bino Gabso was born to a Libyan family that immigrated to Israel in 1949. He’s been serving shakshuka and other north-African favorites to enthusiastic restaurant patrons in Jaffa for the past 18 years. Old kerosene stoves hang from the rafters of the place, just like the moms and bubbes cooked with when Israel first became a country. Dr. Shakshuka is known for its Libyan-style home cooking. It’s a kosher meat restaurant with many yummy traditional dishes including couscous, hraime fish, and kosher merguez sausage. They are best known for– what else?– shakshuka. I couldn’t very well visit Dr. Shakshuka without ordering their signature dish. For a twist, I ordered it with mushrooms. I’d never tried it with mushrooms before, and I must say the idea is inspired! The waitress served my shakshuka in a small, sizzling skillet, as is the custom with most of the local Israeli restaurants. After you’ve eaten the eggs, it’s customary to scoop up the remaining sauce with a piece of fluffy white bread. The bread at Dr. Shakshuka has a light, spongy consistency making it ideal for this purpose. Of course, if you’re watching your waistline, gluten intolerant, or serving for Passover, you can leave out the bread; the dish is also wonderful on its own. I can’t very well write a blog about shakshuka without sharing my own recipe! This is a basic, simple shakshuka spiced just the way I like it. For variety, different ingredients can be added to the tomato base—jalapenos, green chilies, parsley, red pepper flakes, or anything else that sounds tasty to you. I’ve even made shakshuka with a spinach/tomato base that turned out great. Use your imagination! It’s a healthy, delicious dish that is easy to make and easy on the wallet. It’s also dairy free (pareve) and kosher for Passover, which means you can enjoy it all year long! 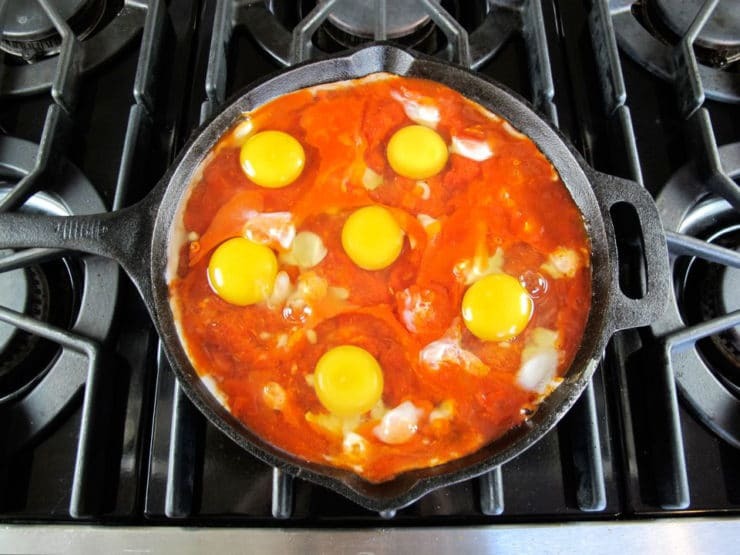 A delicious Middle Eastern egg dish made on the stovetop. Vegetarian, gluten free, healthy and tasty. 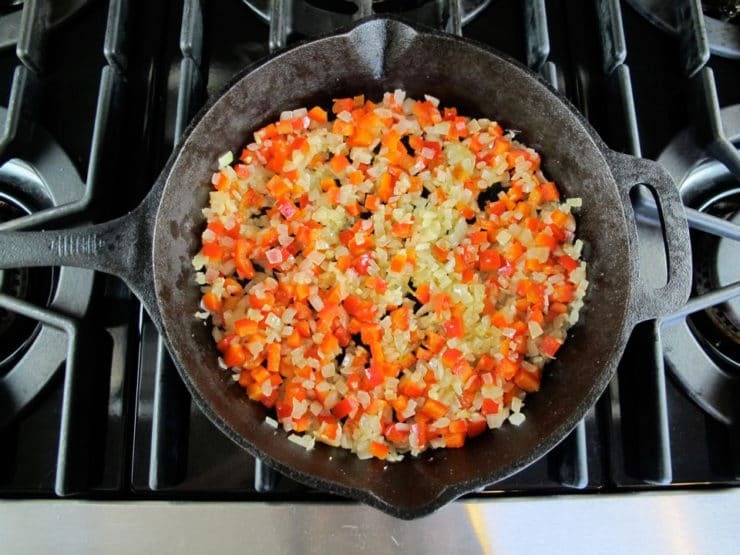 Heat a deep, large skillet or sauté pan on medium. Slowly warm olive oil in the pan. Add chopped onion, sauté for a few minutes until the onion begins to soften. Add garlic and continue to sauté till mixture is fragrant. Add the diced bell pepper, sauté for 5-7 minutes over medium until softened. Add tomatoes and tomato paste to pan, stir until blended. Add spices and sugar, stir, and allow mixture to simmer over medium heat for 5-7 minutes until it starts to reduce. At this point, you can taste the mixture and spice it according to your preferences. Add salt and pepper to taste, more sugar for a sweeter sauce, or more cayenne pepper for a spicier shakshuka (be careful with the cayenne... it is extremely spicy!). Crack the eggs, one at a time, directly over the tomato mixture, making sure to space them evenly over the sauce. I usually place 5 eggs around the outer edge and 1 in the center. The eggs will cook "over easy" style on top of the tomato sauce. Cover the pan. Allow mixture to simmer for 10-15 minutes, or until the eggs are cooked and the sauce has slightly reduced. 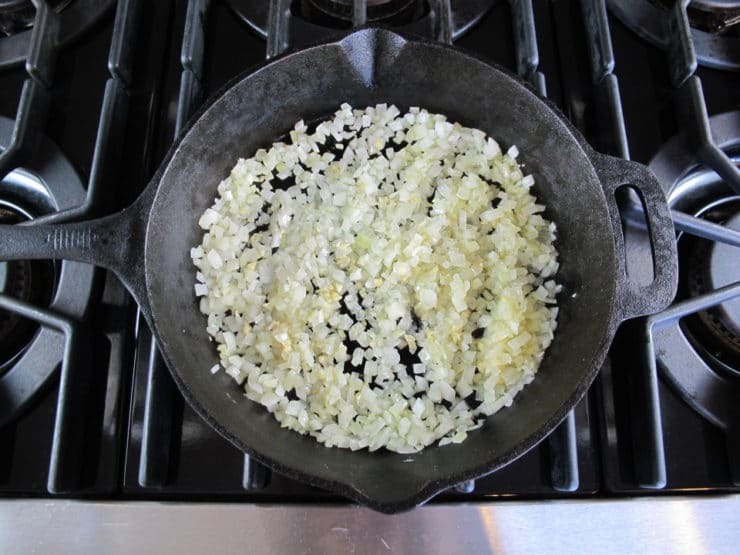 Keep an eye on the skillet to make sure that the sauce doesn't reduce too much, which can lead to burning. Some people prefer their shakshuka eggs more runny. If this is your preference, let the sauce reduce for a few minutes before cracking the eggs on top-- then, cover the pan and cook the eggs to taste. Garnish with the chopped parsley, if desired. Shakshuka can be eaten for breakfast, lunch, or dinner. For breakfast, serve with warm crusty bread or pita that can be dipped into the sauce (if you are gluten-intolerant or celebrating Passover, skip the bread). For dinner, serve with a green side salad for a light, easy meal. Thank you, thank you, thaaaaank youuuuuu, Tori. I loved reading this post. I’m gonna keep it in front of me, so I can read it while I’m following this recipe through. I’m planning to make it for my wife today (it’s Egg Sunday for us). Have a shakshukin (which means awesome in my language), day. I love shakshuka and have eaten it in many restaurants in Dubai. I have always wanted to try it at home and was looking for an easy recipe to follow. I finally found one. It really turned out well and my family and I enjoyed it. Thank you for the recipe. Thanks for providing this recipe! I’ve always wanted to try Shakshuka! Whenever I try a new recipe I follow it exactly to see if/what I’d want to tweak in the future. This was a delicious foundation to build on! While it’s not complex in flavor (though that of course is subjective), my husband and I enjoyed it. I’ll experiment from here on out using this recipe as a base. From what I hear that’s the heart of Shakshuka anyway! For this one, I adjusted the way I served it to stretch this for further meals. Served over a rice/quinoa blend and some diced avocado. I also threw some cilantro on top which brightened up the dish a bit. 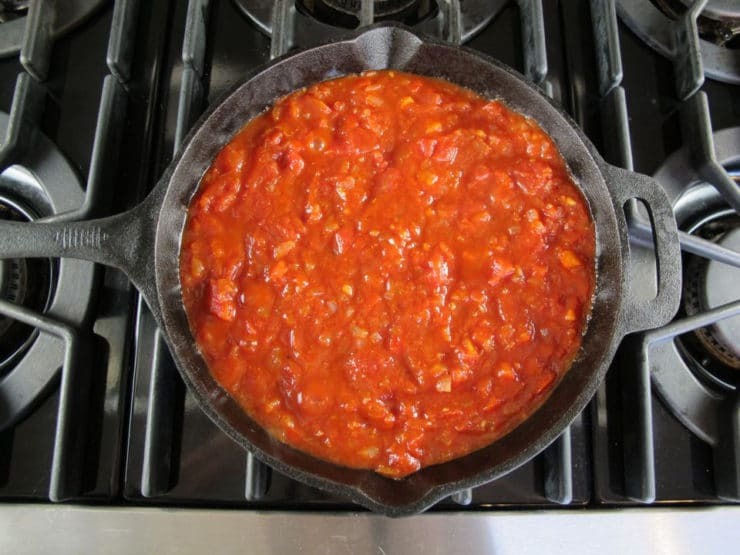 Tip: add the tomato paste shortly after the peppers begin softening and allow the mixture to darken a shade before stirring in the canned tomatoes. Stir constantly to prevent it from burning. The darkened tomato paste brings more depth to the overall flavors — do the same whenever you make red (marinara) sauce! Also, the I cut the cook time for eggs in half and they were still well done, so I’ll probably just eyeball that step in the future. But overall, satisfying and tasty!! Thank you for publishing this recipe. Absolutely unique and delicious. I truly appreciate your version and style of interpreting your personal experiences and insight into recipes that are staples in one destination and completely unknown in most others. Your website is easy to navigate and interface. Please keep up the excellence. Looks great. I will try it tonight as part of a 5:2 low cal diet. How many eggs per serving did you assume when calculating the nutritional values? Since I first learned of shakshuka, maybe in 2014, I've made in a dozen different ways. I maintain the basic concepts, but really, this can be improvised almost any way you want, with whatever you have on hand. Late-night sneaky soldiers, and anyone else who knows their way around a few kitchen techniques can have a lot of fun making it up as they go along. And, for my tastes, it doesn't have to be vegetarian. First time I tried it with meat—I used the leftovers from a big batch of N.Y.C.-style cheesesteak I'd griddled up the night before…slivered ribeye, onions, bell & hot peppers, garlic, celery seed powder, oregano, with a generous pile of mozzarella. Next day, I started by chopping even further the ’fridge congealed steak mixture, sautéeing that with EVOO & butter with even more fresh chopped onions. Then I added the spicy marinara I'd made. Eggs on top. Lid on; halfway through, scrape some Parm Regg off the wedge, through a little white wine around the edges of the pan. Return the lid and finish the eggs. I like to spoon on some sour cream or creme fraiche when I plate up, garnish with chives or scallion greens. Seriously, readers….learn the basic technique, then make it however you might enjoy it. Can this be made ahead of time, except for the eggs to be added right before serving time? Hi Sheila– yes, absolutely. Keep sauce refrigerated until ready to use. Just be sure to leave enough time for reheating the sauce, and for the eggs to cook to desired doneness. Was looking for a breakfast recipe to use my rather abundant amount of garden tomatoes… this was great! I used aleppo in place of chili powder and pepper flakes. Added some cotija cheese on top, DELICIOUS! A chef I follow on Instagram recently posted an absolutely beautiful photo of that morning’s shakshuka. It looked so delicious, but I’d never heard of it. What’s shakshuka??? So I googled and checked out a few recipes. I made yours this morning and it was absolutely delicious! I eat a lot of eggs and I’m so excited to have such a delicious (and easy!) new way to prepare them. I’m looking forward to experimenting with spices and other ingredients. Thanks so much for sharing your recipe! My mother used to make this for dinner with leftover sauce from Sunday macaroni sauce and added some fresh peas. Great budget meal. So good. I have made it many times without the pepper but I will try it next time. Tori. I had been wanting this dish for a long time and luckily it was on a menu in Kuwait City 8 months ago. It was just what I had hoped. I have had your recipe bookmarked since my return to Louisiana in January. I was afraid to try it myself for fear of disappointment. I followed your recipe and wow, it was really delicious. I am so happy now haha. I added a little extra cayenne and it was almost too much. I use a good bit of that in my gumbo. Thanks for the story and recipe. I’ll check out some of your other recipes. Glad you liked it Bryan! 🙂 Welcome to the site. I cooked this recipe when I was in Tel aviv. The spices I got from ha carmel were so much more potent – it was a great experience! I use Shakshuka regularly now to impress people. Quite successfully so! I was so thrilled to try out your recipe. My husband had been bugging me for a couple of years to try it out, but the number of eggs required kindof put me off though i knew id love it. This year i decided not to put it off and found your recipe while googling. Seeing your Jewish version was rather thrilling, knowing it’s going to be authentic unlike the local types we get here which are very sweet (yuck!!). With the blessings of the Almighty, the result was fantastic as my husband and i had it for our break fast meal this holy month of Ramadhan. Thanks, Tory, I’m going to try out more of your Jewish recipes. Food ALWAYS brings people together! My 4 grandparents came from Istanbul..they moved to Peru in 1917.I remember my grandmother’s shashuka,she did not make it with peppers,hers also had slices of Kashkaval cheese,it was delicious! I moved from Peru to Florida 45 yrs ago,I still make it..great breakfast on weekends. I made this for a brunch with friends and it was so good! I used Aleppo pepper instead of cayenne, which was flavorful and gave it a little heat but not too much. My family is of Maltese heritage. My family lived in Tripoli Libya for many years, prior to WW2. 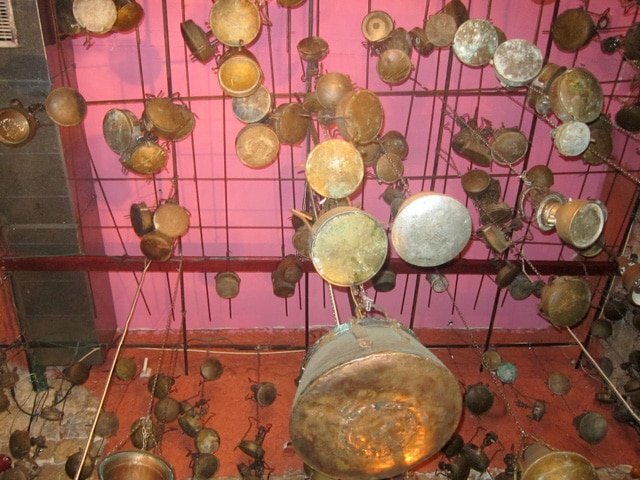 Mom made many Libyan dishes. We have some of her recipes, rishta, couscous are two dishes she excelled at. Her rishta noodles and couscous were both made from scratch and steamed with great care. I wonder, do you have any other Dr. Shakshuka recipes? Thanks so much for this one! Btw, Mom made hrimi for dad with eggs poached in the sauce as the protein. Best. Will, Aka, The Roadside Pie KIng. I do! I gathered them for a cooking project I am working on. Will share details soon! When I took my wife (A Catholic Portuguese) to Israel for the first time she absolutely fell in love with the food. One of her favourites is Shakshuka. I make it quite often. It’s a great winter meal, summer meal, breakfast, dinner or anytime you feel like a healthy meal. Dr. Shakshuka is truly a gem. I only just heard of Shakshuka two days ago and decided I NEEDED to make it… this recipe is phenomenal and I will be making this often. Thank you so much – the spices are PERFECT. I’ve made this recipe several times and my family always comments that it’s better than the ones we’ve had at cafes. I use fresh tomatoes and add chorizo sausage – it’s absolutely delicious 😋. Thank you for sharing your recipe! Happy you’re enjoying it Andi! This dish turned out fantastic, and I wouldn’t feel right about not leaving a review. Usually when I find a recipe online, the seasoning just never seems good enough. But that was not the case with this dish–the seasonings were perfect, and left the dish with an awesome spicy kick. It’s going to become a staple for me and my husband. Love this!! Easy to make and taste great!! My daughter and her boyfriend both loved it!! Thanks for posting the recipe…will be making this many more times!! I saw reference to Shakshuka in a newspaper article about food trends. The article gave no details so I looked it up and found this recipe. Since we are attracted middle eastern foods and flavours we decided to make it for lunch. We used our own farm fresh eggs and followed the recipe fairly closely. We thoroughly enjoyed lunch and will definitely put Shakshuka on the top of the list for breakfast or lunch in the future. Thanks for sharing this great recipe and encouraging a new healthy food option. I made this dish and loved it! Next time I’ll add black olives and cayenne pepper. It was about 0 degrees F in my area today, so this made a hearty, warming breakfast (I made it very spicy). One question. You say the eggs cook “over easy” style, which means flipped and cooked on both sides, but, to be clear, they’re really not flipped, right? Thanks! Sunny side up would be the more appropriate term, although when they’re fully cooked the white part will cover the yolk– so you won’t see the “sun” if you cook the eggs through all the way. 🙂 Glad you enjoyed it! Great recipe. I added 2 tbsp of harissa and a serrano pepper because I like things spicy. Love it, especially now I’ve given up carbs and sugar for my health. Learned about this dish from a TV show and thought looks delicious. I really love your recipe. It’s so filling and tasty. I burned my tongue because I couldn’t wait to taste it 🙈 I’m sure this is not traditional, but I added mushrooms to make it a bit more hearty. Thanks so much! My family and I really love it. This recipe has my salivary glands pumping and I haven’t even tried it yet. Though I’ve still not made my long anticipated visit to Israel, in the interim, this recipe is a great way to bring a flavor of Israel to me. 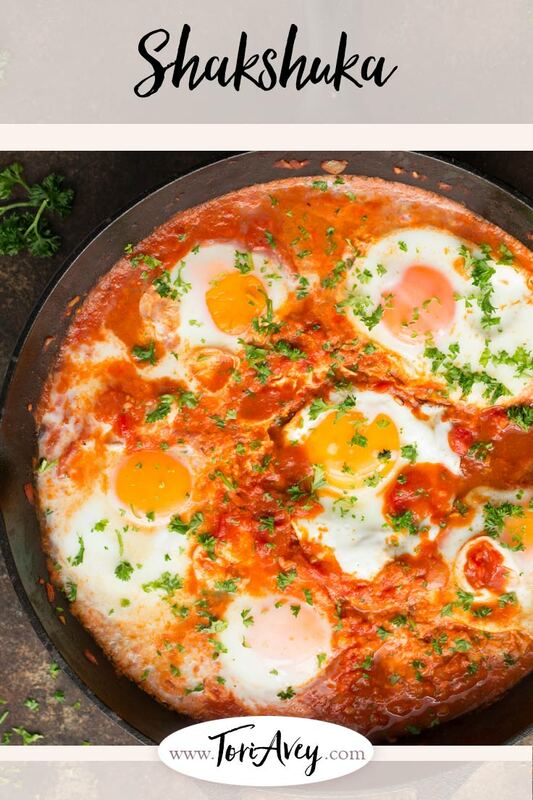 I heard “shakshuka” for the first time while watching television, so I Googled it, and, wallah, I found your wonderful food blog. Thank you for sharing it. I absolutely love this recipe! We add different vegetables each time and top with crumbled goat cheese. I add goat cheese and parsley on top when the eggs are about half done. Perfect!! Had trouble putting the eggs in (needed 3 hands) until I broke the eggs in little cups ahead of time. Then just make a hole in the sauce with a spoon and the other hand just rolls the eggs into the holes. Try it with a Ras el Hanout spice blend- amazing. I’ve made this before with leftover Italian meat sauce, or leftover Mexican chili! LOL I thought I was original. now I need to remember the proper name. I fell in Love with this Dish when I was on the Island Ko Phangan in Thailand. The resort I staid at had it on their breakfast buffet. I ate it every day and can’t wait to make it. Thanks for the recipe!! Yum ! Found myself with alot of tomatoes and eggs searching for a breakfast recipe and this is what I found. For those of you that are reluctant, for your own good, try this recipe. Chances are you might like it. Thank you Tori for posting this recipe and thank you to the people that invented it. I made a half recipe in a small cast iron skillet just for me, since my wife doesn’t tolerate tomatoes very well. I made it sticking to the recipe and it was wonderful. I used a vented multi-sized cover, so I had to cook it a little longer for the eggs to completely cook, but it was delicious. I used fresh tomatoes, pepper, garlic, and onions from my garden. I opted not to add the optional sugar. This is a great dish and can be added to for variety. This will be a regular dish for me from now on. Harry, fyi, I made a shakshuka this morning that was chicken stock and potato-based, instead of tomato-based, with many of tori’s ingredients & it was awesome. Unless your wife is nightshade-intolerant, she should enjoy it. Good luck! I made your Shakshukah for Shabbat dinner this Friday. It was the first time I’ve ever made it and the first time I’ve eaten it in probably 15 years. It was so fabulous! Everyone loved it and I’ll definitely make it again. I added some Ras El Hanout and Sumac for added flavor- delish. Can this be made in a normal skillet?? Yes! No problem, just make sure you have enough oil in it to keep the onion and garlic from sticking. Been making Shuka for years as I used to live in Israel and got addicted to it. Here is a tip – on the second day when its a bit more solid or drier than usual, add it to a proper pitta with israeli houmous – yummmm. Thank you so much for the recipe and to all the people who wrote in with the variations and histories. I love this dish and can eat it for breakfast, lunch and dinner — especially nice on an evening after a busy day at work. I sometimes make the sauce preparation and freeze it for a couple of meals. I just watched Flavors of Israel on JLTV, and Dr. Shakshuka used beef merguez sausage in his recipe. I’m looking forward to trying it with your recipe. Thank you for giving us such great info on your site! I just had lunch with the doctor himself a few days ago, and enjoyed the merguez version there. 🙂 Beteavon! Emily, I just checked the print version and peppers appear there – not sure why it’s missing for you. Can you tell me what browser you are using? I saw this on TV and Dr. Shakshuka made it with meat. Would you happen know what type of meat he used and what the ingredients were? The restaurant makes several varieties of shakshuka, I’ve only tried a few. I’m in Israel now for the next few weeks, I will try to stop by again and taste the meat version 🙂 I will keep you posted. I had the Shakshuka with shawarma at Dr Shakshuka and it was delicious ……. 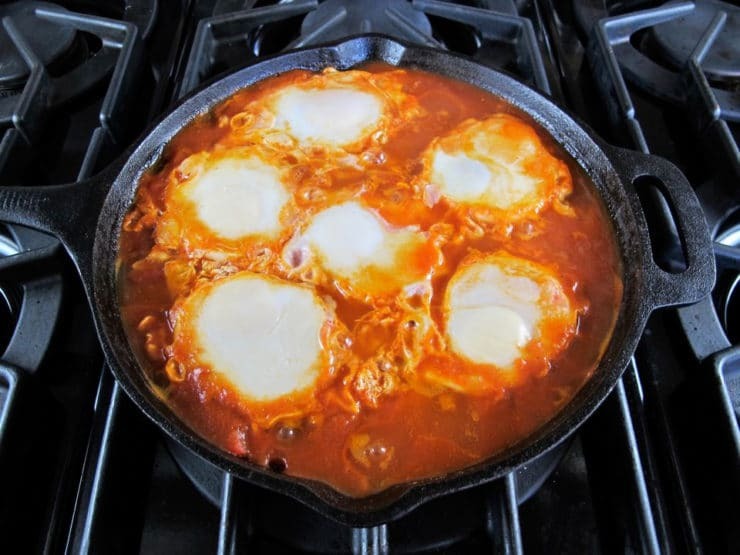 I always use this recipe when making Shakshuka … Am making for dinner tonight and already hungry !!! This dish bring me back to wonderful Tel Aviv. I love to jump into a good Café every morning for a fresh cooked Shaksusha, salat side dish, pita bread, humus and fresh orange juice. Thanks for this great recipe. I never had shakshuka before, so when I came across this recipe, I wanted to try it. I FINALLY made it tonight, and I must say, I’m in LOVE. Simple, healthy, allergen free, and tasty! Where has this been all my life??? It was absolutely perfect. Even my picky eater, anti-healthy husband loved it. 🙂 I can’t wait to have it again. Thank you so much for this. Hi A, Tori’s assistant Ashley here. Currently we do not calculate nutrition info for our recipes. You might try an online nutrition calculator, though the results aren’t always accurate. Do you think this recipe would work if you mixed the eggs first? I am looking for something special to make my mother for Mother’s Day and this looks perfect only she doesn’t like her eggs with the yolks and whites unmixed. Ekoori, a Parsee or Zoroastrian dish, is basically shakshuka with beaten eggs. The spicing is a little more Indian, with some turmeric. Ancient Iran may well be the origin of many of the Middle Eastern egg dishes, as eggs played an important part in religious ritual. I’m a bit late Naomi, but for future reference… I don’t like runny yoke either, and I always finish my shakshuka in the oven. Preheat to 300-350ish, pop it in right after cracking open the eggs, and cover. I take it out once I smell it cooking throughout my home and once the eggs are white on top. Never a problem, and always cooked all the way through. Tip: used canned tomatoes and don’t drain. Finishing in the oven requires some extra liquid to keep it from getting dry. Daughter made and gave me the link. Ex hubby is Sephardic and love the recipes. l am going to get brave and try this adding diced eggplant. Top with feta….. will let everyone know. Probably better to precook the eggplant, since it takes a while to soften it, whilst the shakshuka cooks very quickly. I had a shakshuka today in New Jersey of all places with diced egg plant and a dollop of plain Greek yogurt in the middle of the eggs. The eggs were well done and the egg plant,I believe, was initially sautéed before it was added to the rest of the ingredients. It was definitely finished in the oven and it was spectacular!! When visiting Israel, I had shakshuka every morning and it had eggplant and other veggies. I love it and saute as John suggests. Its wonderful! I also like roasting a red bell pepper and then saute quickly before tomato addition. This is now one of my staple breakfast dishes! It’s so quick and easy to make, and it’s always a hit! I mixed a large batch of the spices and I keep it in jar just for making Shakshuka – use 1 Tbsp instead of a tsp of each. I’ve also made it with 2 roasted red peppers from a jar instead of 1 fresh and it’s just as excellent. Makes a fantastic quick breakfast when camping, as well! I have a Artisan bread bakery in Durban South Africa, made this shakshuka this morning for breakfast with fresh hot duka infused Ciabatta bread. This will be on my menu from tomorrow. I was looking for a recipe that used tomatoes, peppers, onions, and eggs your recipe came up. I made it and i’m hooked. This was super yummy. We had it with rice and it was great, it was filling, and very satisfying. Thank you. Definiteley will keep this. I like the idea of serving this over rice.. No bread needed to sop up all the yummy sauce. I’ll try it with brown rice tonight. This was amazing! Made it in 20 minutes and it tastes great. Yum! My mum adds chickpeas into it it’s amazing!! I found this wonderful sounding food on FB, now I know I just must make it, I have been to Israel many times, Jaffa included. The fotos do look familiar, thanks very much. Got farm fresh eggs today and looked for something that would honor them. Very excited. Just placed it on the table and everyone is happy. Next time I would leave out the sugar. This is the third day in a row when I’m going to cook this and talked about to four other friends. In return, heard about the Spanish omelette, which is next on the list. I do it with just red chilly powder and add freshly ground pepper on top of fried egg. And melt some sliced Amul butter on top in the end. This is really tasty. I’ve been making Shakshuka for breakfast for a few years now. I like it spicy. I use a hot, smoky paprika from a local spice house. OMG is that good! I make it on Sunday, then store it in individual Tupperware containers. I heat it up in the morning with an egg. Heaven! I never heard of this one (Ashkenazi background) but will be trying it out soon! I’d never made shaksuka because it sounded boring, boy was I wrong…so much flavour, so much yum! I did make a few changes to suit our tastes, I cooked a sliced chorizo and set aside before adding the onions to the skillet (mainly to entice my husband to try it ?) and added it again just before adding the eggs. I didn’t add any salt because I crumbled Greek feta over the dish before sprinkling with parsley. My eggs were a little overcooked, so I might only cook for a few minutes less next time, but this is definitely a regular now! Thank you so much for an easy, yet absolutely delicious recipe! I used merguez, which is a North African lamb sausage. But I split it open and crumbled it into the onions and peppers. Fantastic. Delicious! We like to top with crumbled feta as well as the parsley or sometimes, cilantro. Served this recipe to our Synagogue Brunch and Learn session and you received praise from all twenty-five who attended. Great recipe. The sauce for the eggs was a hit! Tip: crumble some feta in this dish for perfection! The feta, egg & spicy tomato combination is like a healthy addiction. I like your recipe. I find that I can prepare the sauce, then use it four times for breakfasts of two eggs poached in the sauce which I spoon over darkly toasted English muffins. I just cook the eggs in a covered pan on the stovetop. Love, love, love this dish. Super yummy and healthy! This will become a regular on my meal planning list. I didn’t add the sugar. I added the spices before I added the tomatoes allowing them become fragrant before adding liquid. Sounds delicious. I’ll try this weekend. Sounds super easy to make, as well as to play as little with the ingredients. Yum! My daughter suggested that we make this after we ate it in a cafe. We made this for dinner tonight and it was great. I like the idea of adding the spices when I saute the veggies and garlic. I think the sauce would be even better the next day.